Lucius Cornelius Balbus was a wealthy Roman politician and businessman from Gades who played a significant role in the emergence of the Principate at Rome. He was a prominent supporter of Julius Caesar and an intimate advisor to the emperor Augustus. He struck coins as for Caesar with Octavian in 41 BC. He served in Hispania under Pompey and Metellus Pius against Sertorius. For his services against Sertorius Roman citizenship was conferred upon him and his family by Pompey. He accompanied Pompey on his return to Rome in 71 BC, and was for a long time one of his most intimate friends. He also gained the friendship of Julius Caesar, who placed great confidence in him. 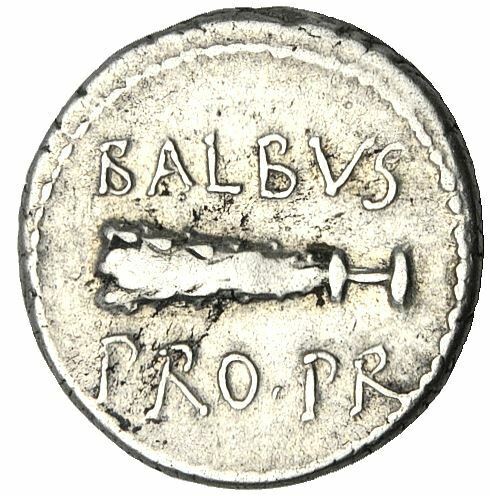 Balbus' personal friendships with Pompey and Caesar were instrumental in the formation of the First Triumvirate. He was a chief financier in Rome. In 40 BC he became the first naturalized Roman citizen to attain the consulship. Balbus kept a diary of the chief events in his own and Caesar's life (Ephemeris), which has been lost.